I was a bit ‘nervy’ walking down to Le Cordon Bleu this morning for the first day of orientation, and was suddenly hit by the reality of it all. Was I mad to be putting a huge chunk of my working life on hold for three months while I spend three days a week at school learning about basic cuisine? I scanned the 30-odd students waiting in reception, desperately looking for anyone who wasn’t the age of my kids or younger. Not another grey head in sight. I guess that puts maturity and experience on my side. I was also surprised by the gender mix – more males than I expected. It was orientation for both Basic Cuisine students (16 of us), and Patisserie students. We were taken to one of the classrooms and after a few manufactured half smiles started introducing ourselves to those nearby. Put a bunch of people in a room with a shared passion and regardless of age, nationality and gender, it’s not long before we’re talking excitedly about why we’re here, what we are expecting and what we hope to achieve. We get introduced to LCB staff. They are genuinely excited that after years of planning and preparation the first ever LCB students at the Wellington school are finally on site. A tour of the school follows with more nervous laughter when we are shown the first aid room. The n the moment we had all been waiting for – the distribution of our French-made uniforms. Two outfits of trousers, jackets, scarves and aprons. LCB logo is emblazoned on the jacket but no individual names – that only happens when you are an actual chef. We purchase our own shoes – rubber, no laces, slip-ons, and yes, crocs fit the bill. After a splendid lunch of French bread and the most deliciously grassy olive oil, mushroom quiche, chicken pie, salad, crispy beans with lardons it’s back to the classroom for the ceremonial handing out of the knife sets. The Wusthof bag’s as big as a small overnight bag and is chock full of knives and utensils. There are knives for peeling, paring, boning, filleting, carving, plus a Japanese style Santoku, a chef’s knife, a confectioner’s knife, a cleaver, a straight meat fork spatula, kitchen shears and a sharpening steel plus another box of goodies courtesy of Wusthof including beautiful French wooden spoons. I’m feeling much more relaxed as the day ends. There’s steady cherry chatter as we load up our gear and head off in our separate directions. More orientation tomorrow and then 8am Monday it’s into the kitchen for the first lesson, knife skills. Yeah, I’m going to love it. The nerves are now replaced by excitement and anticipation. Can’t wait for Monday morning. Now you don’t hear that very often. « “It’s me or the Thermomix”, came the plaintive cry. Heather you’re in just the right place! The uniform was made for you in all ways. have a blast! You look fabulous with your uniform on! Can’t wait to read more. Oh and see a photo of your bag of knives! Love the wee hat! You look like a pro already! Your look amazing in your uniform – and very excited!! Monday morning will come very quickly. Bet you don’t get much sleep over the weekend. I am so impressed at this adventure. You’ll be great and the food will be greater. Plus – forget about being the grey head. The younger students will be inspiring. You look stunning and I am brimming with excitement as you embark on your new adventure….go chef! We’re with you! 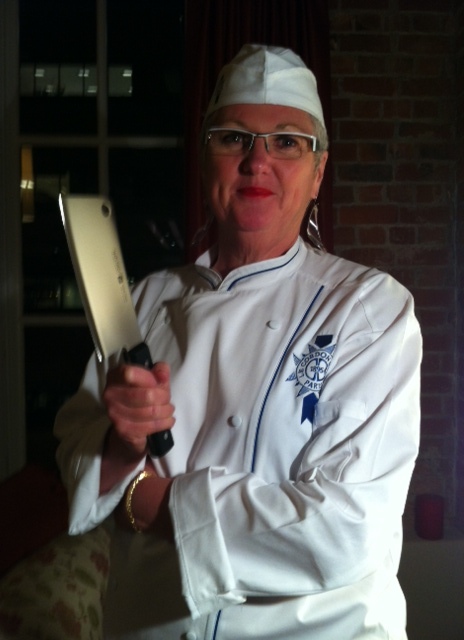 That photograph says don’t mess with me in the kitchen – love it. How exciting – and that’s just me – thinking of all the fun, learning you’ll be having and hopefully no trips to the first aid room. Can’t wait to be be calling you Chef Church. Good luck for the orientation and knife skills. Bet you come home and do a Julia Child practising chopping onions. We are so proud of you! And deliciously nervous and excited in equal parts. Keep writing!